Real Self-Making Bed: Where Have You Been All Our Lives? The Jetsons promised us self-making beds, and they’re here at long last. 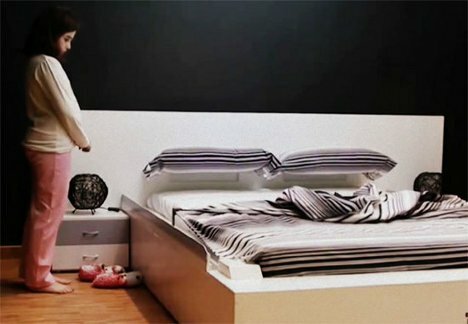 Spanish furniture company OHEA has invented a bed that goes from slept-in and mussed up to neat and tidy in 50 short seconds. Which is probably about 15 seconds longer than it would take you to do it yourself, but what are you, a robot housekeeper or something? When the bed is activated, a mechanical arm smooths out the sheets and covers. The pillows are lifted up and straightened, then dropped back onto the bed after the bed is tidy. There is no danger of a Fifth Element-type entrapment from the bed making itself while you’re lying in it. The self-making bed has two settings: manual, which activates the bed only on your command, and automatic, which starts making the bed after it has been vacant for three seconds. It would be pretty annoying to come back from a midnight bathroom trip to find the bed in the middle of its cycle, though. See more in Futuristic or under Technology. June, 2012.